Apna Microfinance Bank (Pvt.) Limited Punjab. QUALIFICATION & EXPERIENCE: Minimum 2 years experience as RM asset/liability, PB or OM; minimum years of total experience with a financial institution. Preferably 14 years of education from foreign/HEC recognized university in relevant field. QUALIFICATION & EXPERIENCE: Minimum 3 years' branch banking operations experience. Preferably 14 years of education from HEC recognized university in relevant field. QUALIFICATION & EXPERIENCE: Minimum 2 years' experience in deposit mobilization. Bachelor's or Master's degree from HEC recognized university in relevant field. QUALIFICATION & EXPERIENCE: Bachelor's degree. Prior Experience is not Mandatory. QUALIFICATION & EXPERIENCE: Two year's experience as a Credit Manager or 5 year's experience . as a microcredit officer. Education: 14 Years or equivalent. QUALIFICATION & EXPERIENCE: Bachelor's degree from HEC recognized university. In relevant' fields. Prior Experience is not Mandatory. Minimum 14 years of education from HEC recognized university, in Officer relevant fields. Banking experience/internship will be given preference. AMBL offers a professional and challenging work environment with endless opportunities for growth with a rewarding career in the banking sector. 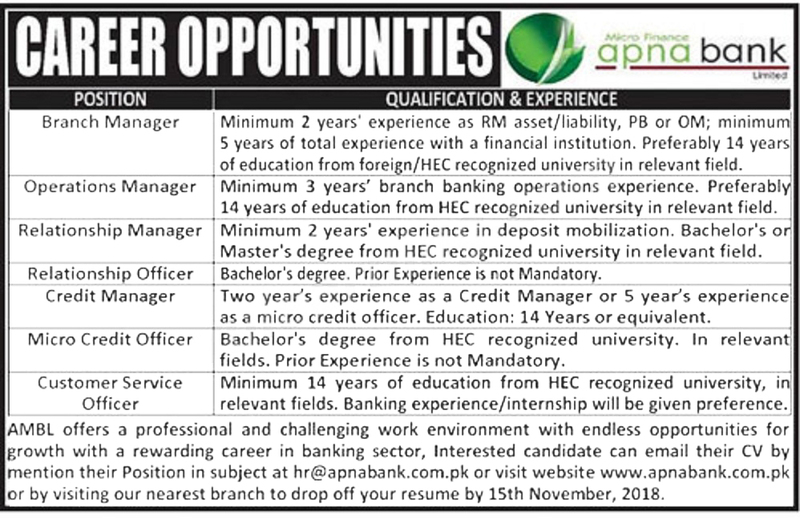 Interested candidate can email their CV by mention their Position in the subject at hr@apnabank.com.pk or visit website www.apnabank.com.pk or by visiting our nearest branch to drop off your resume by 15th November, 2018.